Performers more and more often avoid grandioso festivals and mainstream art centres in order to appear in new, unknown and low-budget places. It is all about eliminating the artificial relationship between artist and institution and the game that is often a consequence: which form may an artwork adopt in order to comply with a tangle of institutional bans, limits, directions and suggestions? Certainly the artist is someone important for an institution but at the same time he/she is a threat. An artist does not become someone anticipated, his/her coming is not a celebration but moreover a routine element of the programme that creates the image of an institution. In the case of live art, this tension is a negative factor and is dangerous for the art presented. Mutual distrust has existed for decades. Important galleries avoid performers and create false and arrogant opinions about this kind of art in order to have a comfortable situation. Their peace of mind is at the expense of fulfilling the statute mission of the gallery that should be the bringing of honest information to the public which reflects the actual tendencies in art practice. But this artistic truth we see sharply only when we invite performers to our own town, at our own expense. “No budget” events are hard to produce. They require a lot of conducive circumstances. The biggest problem is to assure the artist that his/her arrival, work and money spent will be rewarded with absolute freedom, friendship, openness and the presence of an audience. Only such a situation as this can become a good environment for artistic creativity. The artist must be convinced, that he/she won’t encounter a pressure similar to the institutional pressure that attempts to control his/her art. Another no budget performance art night took place in F.A.I.T, a very non-standard club/bar with an old, overgrown garden. The entrance from the street is vaguely marked and practically unnoticeable for people who are not connected to the space. The open status of the venue and the standard technical equipment available are a silent invitation for performers and curators to participate. 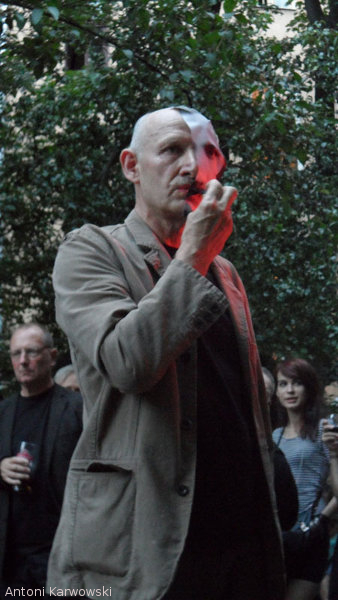 This entry was posted in Performance art events and tagged Alastair MacLennan, Anne Seagrave, Antoni Karwowski, Dariusz Fodczuk, F.A.I.T, FAIT, Krakow, livinggallery.info, no budget, performance art on April 9, 2013 by malgosia1979.